Posture analysis is an active research area in computer vision for applications such as home care and security monitoring. 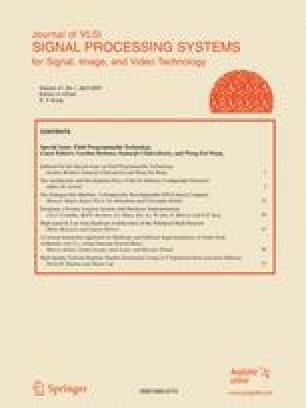 This paper describes the design of a system for posture analysis with hardware acceleration, addressing the following four aspects: (a) a design workflow for posture analysis based on radial shape and projection histogram representations; (b) the implementation of different architectures based on a high-level hardware design approach with support for automating transformations to improve parallelism and resource optimisation; (c) accuracy evaluation of the proposed posture analysis system, and (d) performance evaluation for the derived designs. One of the designs, which targets a Xilinx XC2V6000 FPGA at 90.2 MHz, is able to perform posture analysis at a rate of 1,164 frames per second with a frame size of 320 by 240 pixels. It represents 3.5 times speedup over optimised software running on a 2.4 GHz AMD Athlon 64 3700+ computer. The frame rate is well above that of real-time video, which enables the sharing of the FPGA among multiple video sources. The support of DTI Next Wave Programme, Fundação para a Ciência e Tecnologia (Grant number SFRH/BD/3354/2000), UK Engineering and Physical Sciences Research Council (Grant number EP/C 509625/1 and EP/C 549481/1), Celoxica Limited and Xilinx, Inc. is gratefully acknowledged. Furthermore, we thank the reviewers for their useful suggestions. Advanced Micro Devices (AMD) Inc., http://www.amd.com.